Carter set for centre switch? 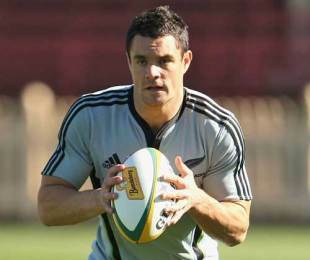 New Zealand's Dan Carter could line up in the unfamiliar position of inside centre against South Africa later this month. All Blacks coach Graham Henry has hinted that he may opt to switch his first-choice fly-half for the Tri-Nations clash as a result of injuries to Conrad Smith and Luke McAlister with Stephen Donald stepping into the all-important pivot role. With McAlister fracturing a cheek bone and Smith straining a hamstring in their team's one-point victory in Sydney to retain the Bledisloe Cup, Henry trialled the new-look backline in training ahead of the clash in Hamilton on September 12. Injuries to Wellington's Tamati Ellison (calf) and Waikato's Richard Kahui (shoulder) have further complicated matters. At the one-day All Blacks training camp in Christchurch today, Carter, regarded as the world's best No.10, ran at inside centre, with Donald at fly-half. A combination of Carter and Donald would not be a surprise but having the latter in the No.10 jersey would raise eyebrows. All Blacks coach Graham Henry suggested that the training combination could be significant. "We're just trying to pick the best team for this test match. Dan can play 12 as we all know. He played 12 for quite a lot of the game against Australia in Sydney [after Smith's injury]. It's just a matter of us picking the best team for this particular test," Henry said. The Donald/Carter combination has been used before - they started at 10 and 12 respectively in the All Blacks Test against the Wallabies in Hong Kong late last year - but it was not entirely successful. In that match, won 19-14 by the All Blacks after they were 9-14 down at halftime, Ma'a Nonu replaced Donald three minutes into the second half to join Conrad Smith in the midfield, with Carter taking over at first five and creating an immediate improvement. Today the backline had Jimmy Cowan at half-back, Donald at fly-half, Carter at inside centre, Nonu at outside centre, Sitiveni Sivivatu and Joe Rokocoko on the wings, and Mils Muliaina at fullback. The alternative backline, which didn't run as much together, was Brendon Leonard, Donald, Isaia Toeava and Nonu in the midfield, Cory Jane and Hosea Gear on the wings, and Colin Slade, brought into the squad as injury cover, playing fullback. The All Blacks forward pack is likely to be unchanged from the Sydney Test. Kieran Read, who played well at No.8 in that match after getting the nod ahead of Rodney So'oialo, showed no signs of the knee injury he picked up in Sydney. However, he did not take part in a physical "clean-out" session and is unlikely to be given the all-clear to play for Canterbury in their Air NZ Cup match against Bay of Plenty in Mt Maunganui on Saturday. Smith and injured halfback Piri Weepu (ankle strain) were both at the training camp at QEII Stadium today but took little part. Weepu was the most active but could do only some light jogging. Neither he nor Smith are likely to be fit for the test against Australia in Wellington on the following Saturday. The All Blacks, going into the test after away losses to the Boks in Bloemfontein and Durban, are likely to continue with the same approach of playing running rugby. "We just have to be good at the set piece. We were flakey at set piece, particularly in the lineouts, in South Africa and if we don't do that in this test it's going to be very difficult," Henry said. The match will be a dead rubber if Australia fail to beat the Springboks in Brisbane on Saturday night. But skipper Richie McCaw said, "You're still playing a test match against South Africa. We'll be doing everything we can to win the game. They're a pretty good team at the moment and we'll have to be better than we have been to give them a shot. "We realise we've got a big game against the Springboks regardless of whether they win this weekend or what the state of play is in the Tri Nations so we'll be looking forward to that. It will be a good challenge." All Blacks training squad: John Afoa, Dan Carter, Jimmy Cowan, Wyatt Crockett, Aled de Malmanche, Stephen Donald, Tom Donnelly, Jason Eaton, Owen Franks, Hosea Gear, Andrew Hore, Cory Jane, Jerome Kaino, Tanerau Latimer, Brendon Leonard, Richie McCaw, Mils Muliaina, Ma'a Nonu, Kieran Read, Josevata Rokocoko, Isaac Ross, Sitiveni Sivivatu, Colin Slade, Rodney So'oialo, Adam Thomson, Brad Thorn, Isaia Toeava, Neemia Tialata, Piri Weepu and Tony Woodcock.